At the beginning of the new Image Comics series GRIM LEAPER, Lou Collins has died thirteen times, and he can be sure that grisly death #14 is just around the corner. This may seem like a weird way to find romance, but that’s just what Kurtis J. Wiebe (PETER PANZERFAUST, GREEN WAKE) has in store for Lou in his new series debuting in May, drawn by Aluisio Santos. Every time he dies, Lou jumps into a stranger’s body, and just as he’s learning something about his new host, another gruesome accident sends him leaping to the next one. Lou wants to escape the violent cycle and find eternal rest - that is, until he meets another “leaper” named Ella. “This is the gory love story you’ve been waiting for, a buckets of blood romantic comedy for the ages,” said writer Wiebe. 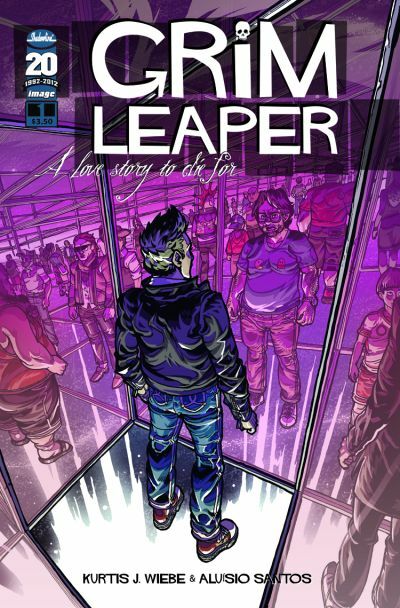 GRIM LEAPER #1 (MAR120418), published under Image Comics Shadowline imprint, will be in stores on May 30. It’s a full-color comic book for $3.50. It is available for pre-order now in the March issue of Previews.